Marrow attacks the police officers in the basement before making her way upstairs. Cecilia and Iceman get attacked by the prime sentinels. They can escape but a firefight between the cops and the sentinels leaves innocents in danger and they decide to stay and help. Cecelia covers Iceman while he evacuates the civilians while Marrow ensures the prisoners don’t escape their cells. A single Sentinel manages to unleash an assault against iceman but Charlotte feeling guilty for leading them their throws her body in the way of the projectile. Cecelia tends to her wound when Marrow suddenly appears. Elsewhere Sabra finally arrives in America. Back at the station Marrow and Iceman prepare to square off when she reveals she’s there to back him up, not kill him. The three make their way down the street which is surprisingly vacant. Marrow and iceman both realize they are walking into an ambush just as they get attacked. Solid story-(for the most part) we now have an assemblage to confront the villain sure it took awhile for Marrow, Dr. Reyes and Iceman to finally meet up but I wasn’t bored waiting for it to happen. Sabra will no doubt enter the scene next issue. Character development-We have Iceman the clown of the X-men in a whole new role; that of defacto leader. Bobby while inexperienced in this capacity does a good job of keeping a level head and being a hero. Iceman shows growth he’s responsible and places his life on the line numerous times for the sake of the greater good. Marrow’s not killing anyone shows great restraint on her part since she grew up in a world where it was kill or be killed and lets face it…she relishes the killing. This is the first time we see that she may simply be a misguided child as opposed to evil incarnate as Storm no doubt thinks. Dr. Reyes is the voice of the new reader thrust head first into the merry world of mutant-dum where everyone will try to kill you when you least expect it. 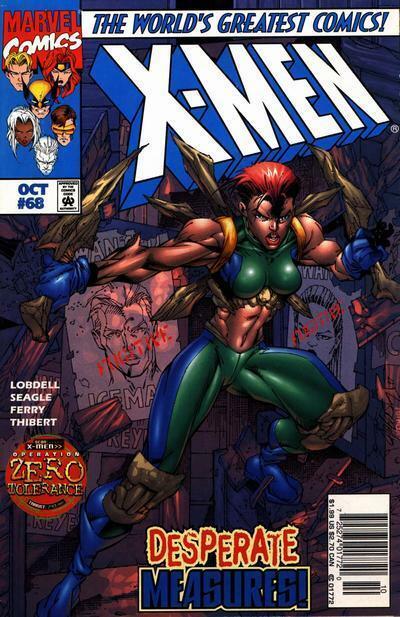 Cecelia also shows that despite her reluctance she may yet prove to be a very valuable asset to the X-men. 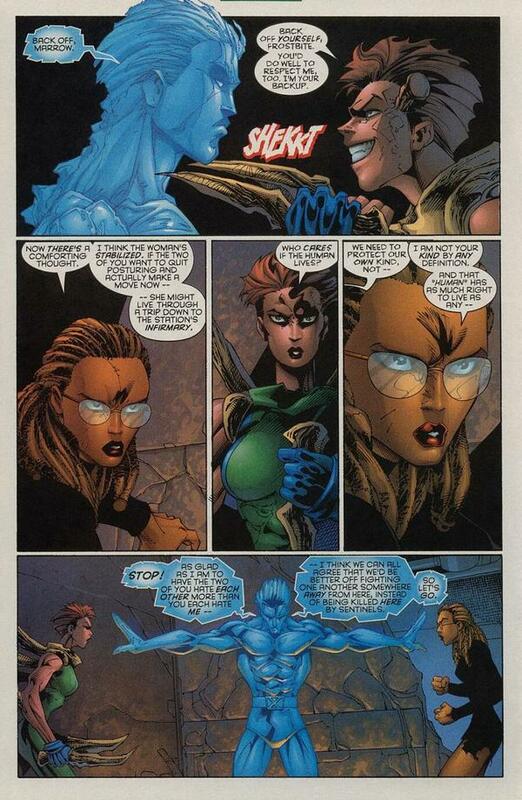 She places her life on the line to protect Iceman as he saves civilians and rallies around him when confronted by Marrow. All around Solid character work and good story progression! Action-Lost of explosions, shrapnel, an all around violence will keep action junkies very happy! Art-Oh lord a guest artist…….what can i say? He’s filling in for Pacheco which is a hard shoe to fill since he’s one of my favorites and draws such strong detailed images. This was not up to the standard already set.